Happy release week to The Retreat by Kelly St. Clare. 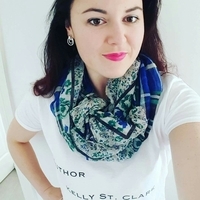 As a treat I have an exclusive interview with the author herself to share with you in celebration of the release! Thank you to Xpresso Book Tours for setting this up. I read fantasy, my mind seems to naturally churn out fantasy/science fiction/action and adventure storylines. I would write in any genre, however, as long as the story interested me enough. Who knows! Some weird part of my brain. As to location; long drives where I’m in the passenger seat, bus and train rides, too. And also when I’m just falling to sleep, or around 5 in the morning. Sigh. My most compelling ideas come from dreams. Sure! 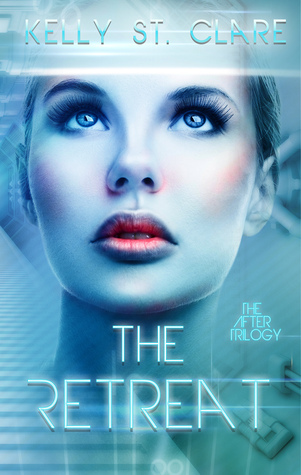 The Retreat is the first novel in my new series, The After Trilogy. The story follows an early twenties genetically enhanced space soldier named Romy – don’t call her Rosemary, you’ll make her mad. The story is set in a future where Earth has been desolated by Global Warming. Now the last slice of humankind exists in space, protecting Earth—turns out some unfriendly visitors rather like the look of this new Earth—and waiting until they can return to solid ground. During a battle Romy’s ship is shot down and she crash-lands on this supposedly unliveable Earth ... let’s just say she doesn’t find what she expects. Have you ever gone out in public with your shirt on backward? Chh, who doesn’t? Except maybe Alexander Skaarsgard. He doesn’t wear a shirt at all. Where did you love of books/storytelling/reading/writing come from? Everything stemmed from my love of reading. While reading, I would put down the book halfway and formulate my own ending. I guess this was the start of my story-telling. I was writing Fantasy of Freedom at the same time! One book is in third person, past tense, and UK English—in space. And the other is in first person, present tense, and US English—in a fantasy world. I’m surprised the characters stayed in the right worlds. The freshness of the story. I love The Tainted Accords, but I have a major idea queue. I’ve been bursting to crack into another story for a couple of years. What’s your favourite type of scene to write? Action scenes, without a doubt. Just one! That’s evil. Ayres Rock in Uluru, Australia. And Greece! Oops, that’s two. Ah heck, Canada as well. I can do a perfect impersonation of a seagull. I’m quite proud of it. Heaps. I have one in the middle of my kneecap from a Lord of the Ring re-enactment in a blizzard on Mount Tongiriro. Long story. I like to vary where I write. Most of the time I’m in my little study. For the most part my work day is 9-5 (or 7, or 10). If I get an idea before I get to sleep I’ve learned to get up and write it down, or I get no sleep whatsoever. Those nights can be 2-4am. I love my sleep. The idea has to pretty persistent to get me out of bed. Any words for your readers? Santee Sanna Squash Banana. Also—you guys ROCK!